When Kylene Beers and Robert Probst published Notice and Note: Strategies for Close Reading (2012), I knew I had stumbled upon an essential text for teaching close reading. I designed an interactive foldable with the six signposts for fiction and every September, I teach my students the signposts. With every fictional text we read, we identify the signposts, discuss how the signposts lead to deeper comprehension of the text, and understand the author’s intentions. Needless to say, when I heard Beers and Probst were publishing Reading Nonfiction: Notice & Note Stances, Signposts, and Strategies (2015), I preordered the book knowing I would include these “new signpost” with my repertoire for teaching nonfiction reading. As I am about to embark on a nonfiction unit of study with my students focusing on reading and writing investigative journalism pieces that are a hybrid of narrative and argumentative writing, I will introduce the nonfiction signpost and helping students to see “deeply into informational texts” and think critically about the moves that writers make. Contrasts and Contradictions: The author presents something that contrasts with or contradicts what the reader is likely to know, think,or have experienced, or shows a difference between two or more situations, events, or perspectives. Extreme or Absolute Language: The author uses language that leaves no doubt about a situation or event, the perhaps exaggerates or overstates a case. Numbers and Stats: The author uses numbers or words that show amounts of statistical information to show comparison in order to prove a point or help create an image. Quoted Words: The author quote others, directly, with what we are calling a Voice of Authority or Personal Perspective. The author might also list others in citations. Word Gaps: The author uses words or phrases that students recognize they don’t know. I have designed an interactive foldable for my students that front loads the five nonfiction signposts. 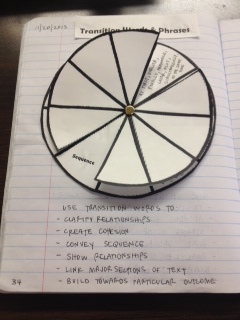 Students can continuously refer back to the foldable in their Interactive English Notebooks. The foldable includes a list of the five signposts with definitions, anchor questions to help think carefully each signpost, and signal words to help identify the signposts. The purpose in designing this foldable is to help students navigate complex nonfiction texts and question the text in a way that encourages student to be critical consumers of information. To grab a copy of this foldable and instructions click here. When students do not understand an author’s vocabulary, they cannot fully understand the text. Good vocabulary instruction emphasizes useful words (words students see frequently), important words (key words that help students understand the text), and difficult words (words with more than one meaning). Janet Allen, author of Words, Words, Words (1999), states, “Children and adults need to see and hear a word in meaningful context multiple times in order to know the word, somewhere between 10 to 15 times.” And with middle school and high school, variety is the key. Teachers cannot teach vocabulary the same way every time. Reading is perhaps the most important element in vocabulary instruction. So, how do I teach vocabulary in my English class? Connotation & Tone – Take the word and apply it to the character and what the character is doing in order to understand the passage. Does this word offer a positive or negative tone? Outside Connections – Have I heard this word in a song, movie, or maybe in foreign language? Connect the word with what you already know. Take a Poll – Using an online polling website like Polleverywhere.com I poll my student about a definition of a word. Students use their mobile devices to select the best definition for a word. Idea Completions – Instead of the traditional “write a sentence using a new word,” provide students with sentence stems that require them to integrate a word’s meaning into a context in order to explain a situation. What is something you could do to impress your teacher (mother, friend)? Why? What are some things that should be done cautiously? Why? Which one of these things might be extraordinary? Why or why not? -A shirt that was comfortable, or a shirt that washed itself? -A flower that kept blooming all year, or a flower that bloomed for 3 days? -A person who has a library card, or a person who has read all the books in the library? -Walking to the post office. -Having a picture you painted hung in the school library. On this Martin Luther King, Jr. Day I wanted to share a foldable I created for a unit on Warriors Don’t Cry, an emotional memoir by Melba Patillo Beals about her experiences integrating into Central High School in Little Rock, Arkansas in 1957. This foldable can be used for any text that addresses bullying, bystanders, and up standers. 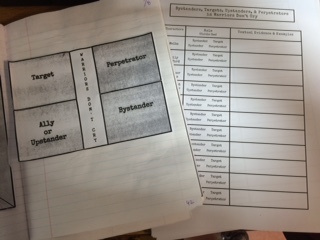 At first I have the students create the foldable and then students work on the character chart in small groups. 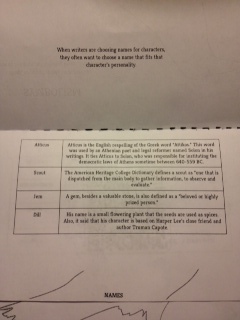 I expect that the students will add characters as they are introduced in the text. It is important to note that sometimes characters are not static and their roles can change. I remind students to make a special note when characters do shift roles and what was the catalyst for this change. If you are able to utilize this foldable for a novel study with your students, please share in the comments section what book or text this foldable fit with. I love taking lessons taught in previous years and turning them into a complex foldable for my students’ English Interactive Notebooks. The Interactive Notebooks are a used for all notes and important information about reading and writing. The foldables allow for students to interact with the information, help understand the content thoroughly, and apply what they learned during activities and assessments. This week we are finishing one of our core texts, To Kill a Mockingbird, and I wanted to address symbolism in the novel. Rather than present a Prezi or give my students a worksheet, I created a mini symbolism flip book with the different types of symbolism throughout the novel. 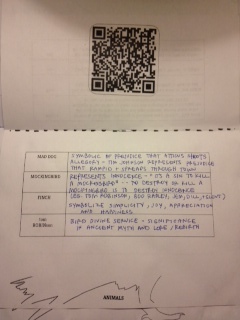 And because I don’t just want my students copying my notes directly into their notebooks,I added QR codes on a few pages of the flip book for students to search the symbolic elements and their meanings from the text. The flip book addresses symbolism of names, animals, and elements in nature. The elements in nature cover the seasons, plants and trees, and fire. 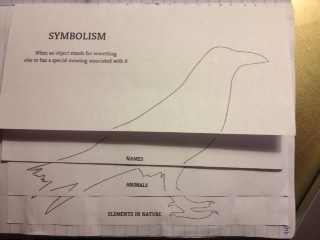 I added the image of the bird on the front of the flip book for an added effect suggesting the title of the text and the symbolic nature of birds throughout the novel. The Common Core Learning Standards require that students be able to determine the meaning of symbols and literary devices when discussing a text. This lesson helps students understand the meaning of symbols throughout the text and read about their significance and order to understand Harper Lee’s intentions, deeper meaning, and themes. This week I am holding a writer’s workshop in my eighth grade English classroom to help my students understand and apply the elements of effective argumentative essay writing. I began the week with an interactive foldable on Ways to Start an Essay which addresses six different strategies for to start any kind of essay. For my students, the two hardest parts of essay writing are the claim/thesis and the analysis of textual evidence that supports the claim. 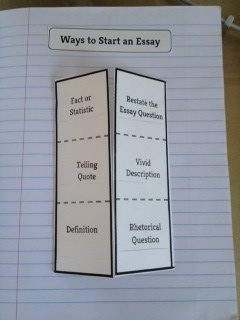 In a post earlier this school year I created a foldable for writing a thesis or stating a claim. Once my students have their thesis complete, we move on to the body paragraph. The body paragraphs are the meat of one’s essay. The body paragraphs must include specific textual evidence to support one’s claim and provide analysis of the textual evidence describing how it supports the claim. Stating, “This quote proves . . .” is not enough. One’s analysis needs to hold the reader’s hand and walk them through the connection between the textual evidence and one’s claim. The body paragraphs should include three or more examples of textual evidence to really prove the claim is valid. I created a graphic organizer for my students to record the textual evidence, summarize the evidence, and describe how and why the evidence is significant to the claim. In completing the graphic organizer, my hope is that it will be easier for my students to craft a body paragraph that explains, proves, and supports the claim. In addition, there is a great Writer’s Checklist on essay writing from Read Write Think that I adapted and had my students include in their Interactive Notebooks to help guide my students in the essay writing process. “All in all” — I had one student write this for each paragraph he wrote in a 5 paragraph essay! Yet, my students were still looking for and asking me what transition words to use in their writing that would act as a road map for both the writer and the reader. I created a transitional words interactive foldable for their journal to offer an easy menu of transitional words that would benefit students’ writing. 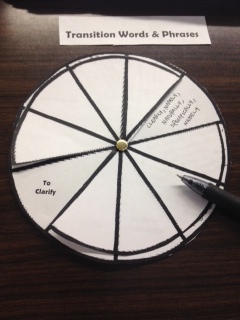 I designed a transitional word pinwheel with wedges taken out of the pie diametrically opposite to each other so that my students would be able to choose transitional words based on purpose and meaning before inserting it into an essay. The idea behind creating this foldable is for my students have models, and multiple examples of transition words and phrases to use with their writing and help their ideas flow.